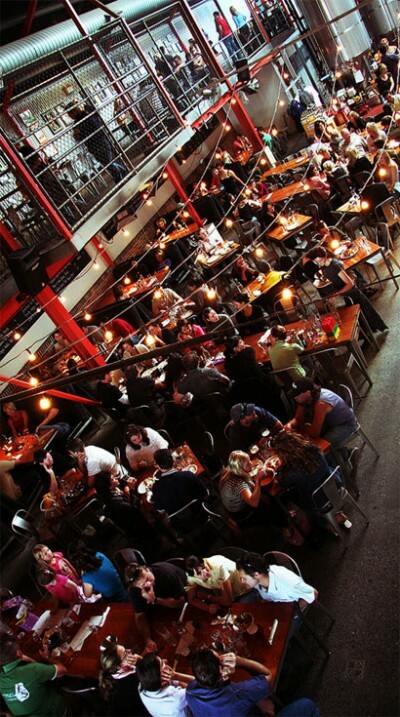 What makes the Dining Hall in the Little Creatures pale ale microbrewery such a popular destination in Melbourne, Australia? It could be that it converges two kinds of places creatives crave into one they can relate to – a third place. The Beerhouse: – In Germany, the beerhouse is the standard. Characterized by long wooden communal tables and Germany’s famous Hofbrauhaus, patrons enjoyed themselves as if they were at an indoor picnic, while dancers, singers and musicians provided a truly festive atmosphere. The Loft: – Owing to tradition, beerhouses are typically in historic buildings, but the Little Creatures Dining Hall is a contemporary interpretation. Converting a light structure warehouse, there’s a definitive loft-like vibe with the open airy feeling of the high ceilings, the rawness of the exposed ductwork and steel structure, and even a mezzanine of more intimate spaces, just as you would find in a residential loft. The third place: – However, it’s the combining of the two that provides a remixing of not only the beer drinking experience, but more importantly, a social experience that feels fresh and current where one can meet friends (and strangers) on a regular basis. Thanks to Springwise for the reference, and photo by snazzsmemoirs.